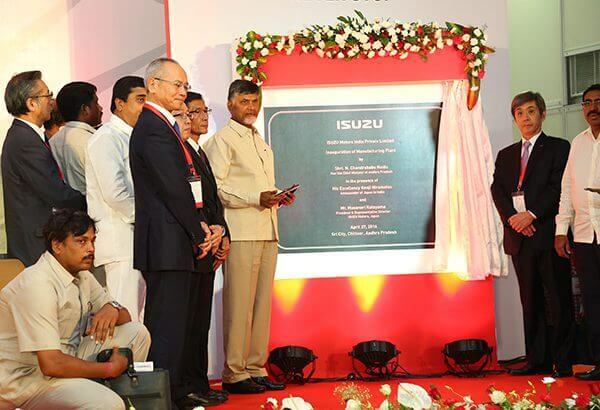 Isuzu’s first ‘made in AP’ product, viz., the new generation ‘ISUZU D-MAX V-Cross’, which is India’s First Adventure Utility Vehicle, was rolled-out of plant by the Chief Minister along with Mr. Masanori Katayama, President, Isuzu Motors Limited, Japan, in the presence of His Excellency Mr. Kenji Hiramatsu, Ambassador of Japan to India and Mr. Seiji Baba, Consul General for Japan in Chennai. “With the presence of auto major original equipment manufacturers (OEMs) and several automotive ancillary industries, there exists a strong ecosystem for automobile sector in Sri City. As the state government is very keen in developing this part of the state as an automobile hub, youth in this region will find ample employment opportunities,” he added.